Crisp gingerbread, sweetly spiced and iced with a sprinkling of sea salt. 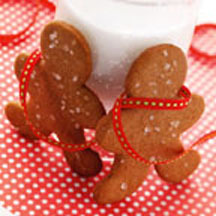 For Cookies: In a medium bowl, whisk together flour, ginger, cinnamon, baking soda, allspice and cloves; set aside. With an electric mixer, cream together 3/4 cup butter and brown sugar until fluffy. Add molasses and ginger; mix. Add egg; beat until blended. On low speed, slowly add flour and spice mixture, beating until blended. Divide dough in half; shape each half into a flat round. Cover with plastic wrap and refrigerate at least 3 hours or overnight. Preheat oven to 350°F (175°C). Line baking sheets with parchment paper. On lightly floured surface, roll 1 dough round to 1/4-inch thickness dusting with additional flour, as necessary, so dough does not stick. Cut dough into desired shapes and place on prepared baking sheets. Sprinkle cutouts with salt; press lightly to adhere salt. For Icing: In a medium bowl, whisk powdered sugar, butter, corn syrup and 1 tablespoon milk until smooth. Slowly add additional milk, if necessary, for desired consistency. Drizzle over cookies; let stand until icing is set.